We’d love your help. 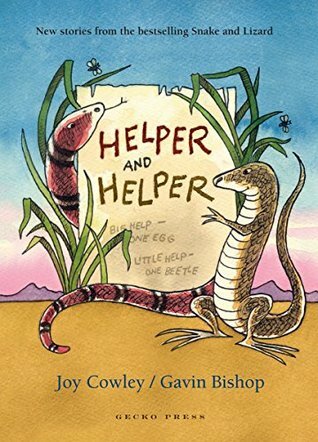 Let us know what’s wrong with this preview of Helper and Helper by Joy Cowley. We should have a new sign,’ said Lizard. ‘Exactly what I was thinking!’ cried Snake. ‘A huge sign at the entrance of our burrow! Snake and Lizard, Helper and Helper. He lifted his chin in defiance. ‘Lizard and Snake! ‘My dear friend, we can’t have that. Creatures We should have a new sign,’ said Lizard. To ask other readers questions about Helper and Helper, please sign up. Cute story with delightful illustrations and two very different characters. Sjort chapters that are self contained stories, sometimes with a moral message or a dark twist. Charming but felt a little fragmented. Traditional story telling at its best. Funny, in a dry matter-of-fact way with a few lessons thrown in for good measure. Snake and Lizard are friends, best friends as Lizard reminds Snake. But sometimes even best friends get annoyed with each other and have disagreements. It is how they work around their disagreements which is so funny. Both want to be right and tend to be a bit cunning in order to prove they are right but the outcome is not always want each one wants. But as true best friends th Traditional story telling at its best. Funny, in a dry matter-of-fact way with a few lessons thrown in for good measure. Snake and Lizard are friends, best friends as Lizard reminds Snake. But sometimes even best friends get annoyed with each other and have disagreements. It is how they work around their disagreements which is so funny. Both want to be right and tend to be a bit cunning in order to prove they are right but the outcome is not always want each one wants. But as true best friends they are at the end of each day, forgiving and kind. Joy Cowley highlights the reality of true friendships, warts and all and we can’t help but love Snake and Lizard. Short fable like stories that can be shared and enjoyed by anyone. My favourite story from this collection is Food and friends. Watch out for the ending but just don’t turn your back on Snake. Snake and Lizard are back! Helper and Helper is the 3rd book of tales about these unlikely friends. Together they have a business helping other animals, offering advice and listening to problems. But the first problem they encounter is whose name should be first on the sign. Snake is wily and cunning, always talking his way around Lizard who is sick of feeling like she’s been tricked. They squabble and bicker, as real friends sometimes do, and learn things about others and each other along the wa Snake and Lizard are back! Helper and Helper is the 3rd book of tales about these unlikely friends. Together they have a business helping other animals, offering advice and listening to problems. But the first problem they encounter is whose name should be first on the sign. Snake is wily and cunning, always talking his way around Lizard who is sick of feeling like she’s been tricked. They squabble and bicker, as real friends sometimes do, and learn things about others and each other along the way. “We need a room inside our burrow, big enough for a rabbit. We can’t talk to our bigger clients outside”. “A huge sign at the entrance of our burrow! Snake and Lizard, Helper and Helper. Big help one egg. Little help one beetle. …and so the bickering goes on but their friendship survives all the tests, including those about rivalry, friends, food, along the way. This a great read aloud book. Gavin Bishop’s illustrations are delightful; soft, warm colours that complement the story. have created another book to be treasured. Cassia Joy Cowley, a fiction writer for children and adults, was born in Levin and educated at Palmerston North GHS and Pharmacy College. She has been published so widely and to such acclaim that she received a Commemoration Medal in 1990, the OBE in 1992 for her services to children’s literature, the Margaret Mahy Award Lecture in 1993 and an honorary doctorate from Massey University in 1993. In Cassia Joy Cowley, a fiction writer for children and adults, was born in Levin and educated at Palmerston North GHS and Pharmacy College. She has been published so widely and to such acclaim that she received a Commemoration Medal in 1990, the OBE in 1992 for her services to children’s literature, the Margaret Mahy Award Lecture in 1993 and an honorary doctorate from Massey University in 1993. In 2004, she received the A W Reed Award for Contribution to New Zealand Literature at the Montana New Zealand Book Awards. Joy has contributed many stories, plays, and poems to New Zealand's School Journal, as far back as the 1960s and as recently as 2010. She is internationally recognised for her contribution to children's literacy and has written more than 600 early readers, along with novels and poetry for children. She has also worked as a teacher of creative writing for children in more than 10 countries and won critical acclaim for her adult novels and short stories.